The Register reports that way back, way back, when the rainforests were good and hot, they prospered and life proliferated. “Global warming is actually good for rainforests, say boffins” reads the headline from Lewis Page, “plus 3 degrees C, 1000 parts per million Carbon Dioxide did jungles a world of good last time”. Not quite, Lewis old chap. Not quite. 1. 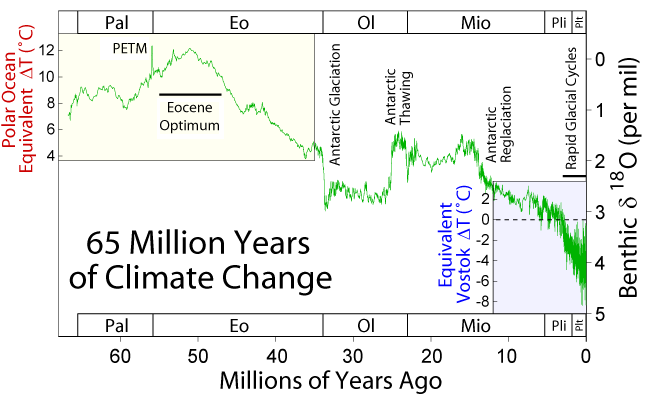 The change in global temperatures at the Paleocene-Eocene border was only “rapid” in geological time – at around 20,000 years for the whole event. Plenty of time for rainforests to adapt. Not like now. Yet evidence of severe droughts in the Amazonian rainforest area today makes the analogy with the Paleocene-Eocene Thermal Maximum rather thin. With the current incredibly fast rate of warming in South America, it’s unlikely that regular, intense, droughts are going to reduce in the rainforest area. Added to the current data, there is every reason to believe that the climate in the tropics was very different at the time of the PETM – the Americas had not yet met, and no Gulf Stream northwards existed. 3. “”It is remarkable that there is so much concern about the effects of greenhouse conditions on tropical forests,” says Jaramillo’s Smithsonian colleague Klaus Winter”, write Lewis Page. Klaus, who ? He’s not even listed on the research paper author listing. Does Mr or Dr Winter have anything to do with this research ? Why does Lewis Page quote hiim ? 4. Have you seen the organisations that contributed to this research ? They include “Colombian Petroleum Institute”, “Petróleos de Venezuela S.A.” and “Agencia Nacional de Hidrocarburos, Bogotá, Colombia” and a number of mining companies. What do they want out of research into rainforest productivity 55 million years ago ? I wonder what Dr Simon Lewis, rainforest expert, will make of this latest “atrocity” from The Register ? When I get the access to this report, I will need to delve deeper into the reasons why Lewis Page has proved, once again, that he doesn’t understand current Climate Change science, and doesn’t understand why the climates of yesteryear often have very little to say about the climate of today and tomorrow. Another chapter in the ongoing saga of the exhausting struggle to educate the mainstream media journalists to check their Climate Change stories thoroughly before publishing. You may have heard of “Amazongate” – the Amazon would seem to be capable of withstanding more frequent drought caused by Global Warming – according to one interpretation of an isolated piece of research. However, if you believed that take on things, you’d be very much mistaken in doing so. And the person you’re most likely to be able to have believed on this story would be Jonathan Leake, writing in The Sunday Times. Amazongate : Why Investigate ? The Climate Change “sceptics” are calling it “Amazongate”. I’d rather like to rename it “Investigate”, because of the appalling lack of investigative journalism that surrounds latest news of the Science of the Amazon basin. Why is it that so many mainstream newspapers repeat the same lazy accusation that somebody has uncovered “yet another error” in the IPCC report ? This looks like a flawed attempt to create a narrative of scandal, where there is actually nothing to find. Many expert commentators have tried to explain that, yes, the IPCC had a couple of problems, where they have used information that was not peer-reviewed Science, and findings that other experts disagree with. But no, the IPCC Fourth Assessment Report still stands, and is still the best statement that Sciencekind can give on the subject of Climate Change. There is no evidence of the kind of wrongdoing in the work of the IPCC that the Climate Change “sceptics” claim. So why do the journalists carry on with the narrative of doubt ? Could it have something to do with the fact that they don’t check the facts ? And why do most of the mainsteam news organisations take the same line, with the same sloppy thinking and poor arguments replicated in article after article ? Could it be that there is no investigative journalism left these days ? Why does it have to fall to the independent web loggers to point out the facts ? Why can’t the newspapers at least hire Environment writers who have studied Climate Change Science ? Continue reading Amazongate : Why Investigate ? Posted on March 16, 2010 Author JoCategories Bad Science, Climate Change, Media, Non-ScienceTags Amazon, Amazongate, Climate Change, Climate Change Science, Climate Science, denial, denier, Global Warming, journalism, Journalist, obstructer, sceptic, Simon Lewis, skepticLeave a comment on Amazongate : Why Investigate ?